As a kid, and up until recently, I was not a lover of trifles. That’s because the only trifle I knew was packed with thick, revolting custard and artificial cream. I guess I thought that was the only way it could be. How wrong was I? Trifle can be anything you want it to be, and in mine, there isn’t so much as a whiff of canary-yellow, lumpy custard. 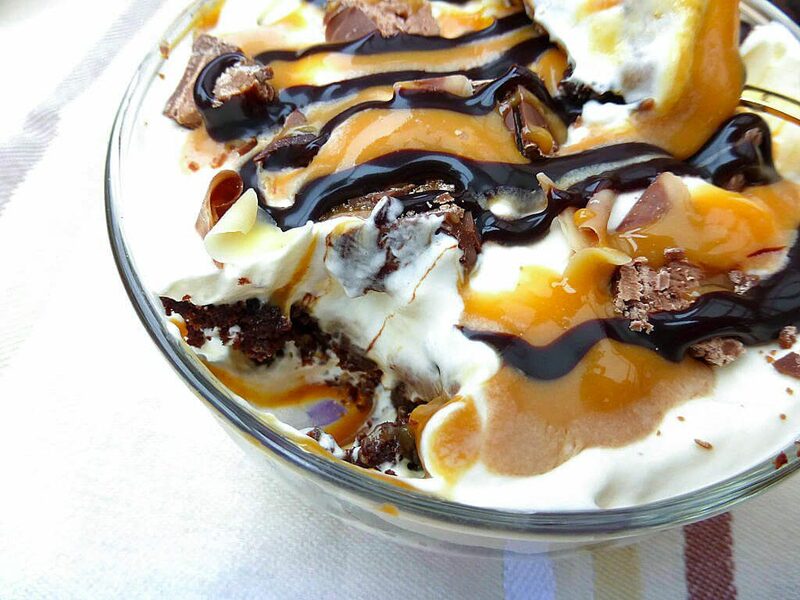 Like these, Mars Bar trifles, made from leftover chocolate bars, caramel and brownie. The brownie was leftover too, from my Mars Caramel Brownies . Regular readers will attest that very little goes to waste in my house, and I can find use for pretty much everything. 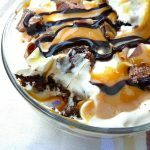 I whipped up some cream and just threw it all together, but these Mars Bar trifles were stunning. The ingredients below made four huge desserts. You could easily amend the amounts to reduce or make more. Or, why not make one large dessert, like I did with my Chocolate Strawberry version? This recipe was originally published in April 2017. It was updated and re-published in December 2018. Crumble the brownie or chop into pieces and using half, divide into four and assemble in the bottom of bowls or glasses. Push down gently to try to get it fairly level. Spoon over a little caramel in each, top with some cream and then a sprinkling of chopped Mars. Repeat with the remaining ingredients (keep around 1 tablespoon of caramel for later), finishing off with the cream. 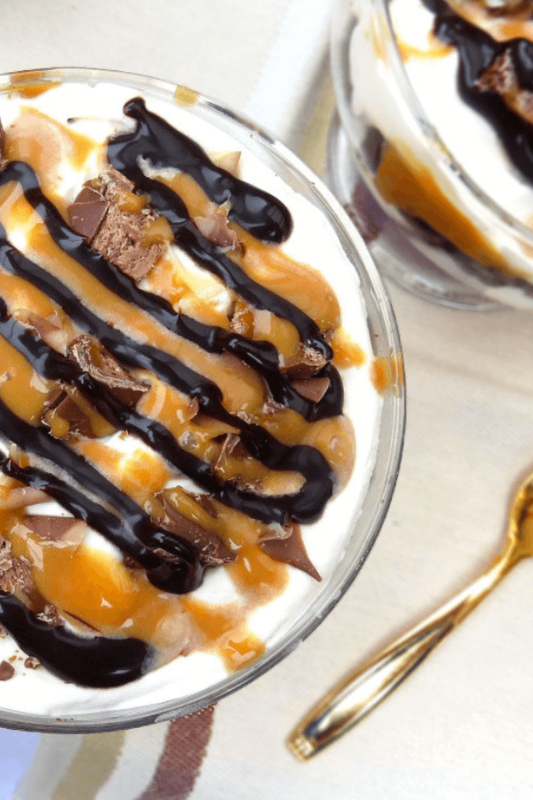 Add a touch of milk to the retained caramel and drizzle over the cream along with the rest of the chopped Mars. 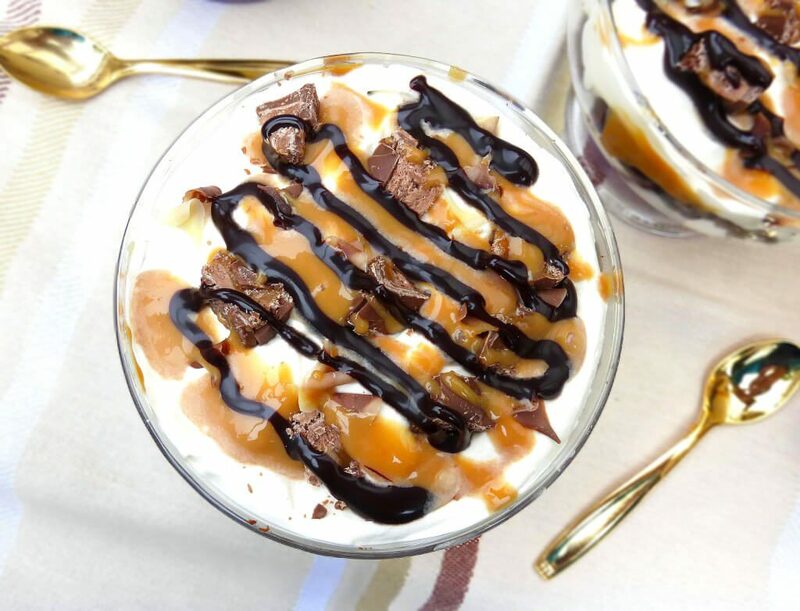 Finish off with melted chocolate or sauce and finally, throw over a few additional chocolate decorations if you so fancy. Place in the fridge until ready to eat. Enjoy!